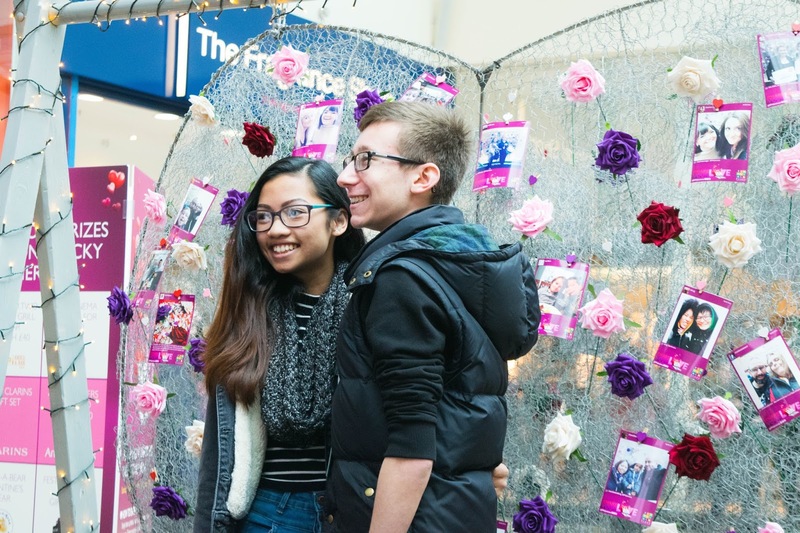 Festival Place shopping centre in Basingstoke is spreading the love this February with their special ‘Share Your Love’ Valentine’s competition. Launched on Saturday 6th February, the campaign invites customers to share photos of themselves with loved ones on Facebook, Twitter or Instagram with #FPValentines for the chance to win big prizes. 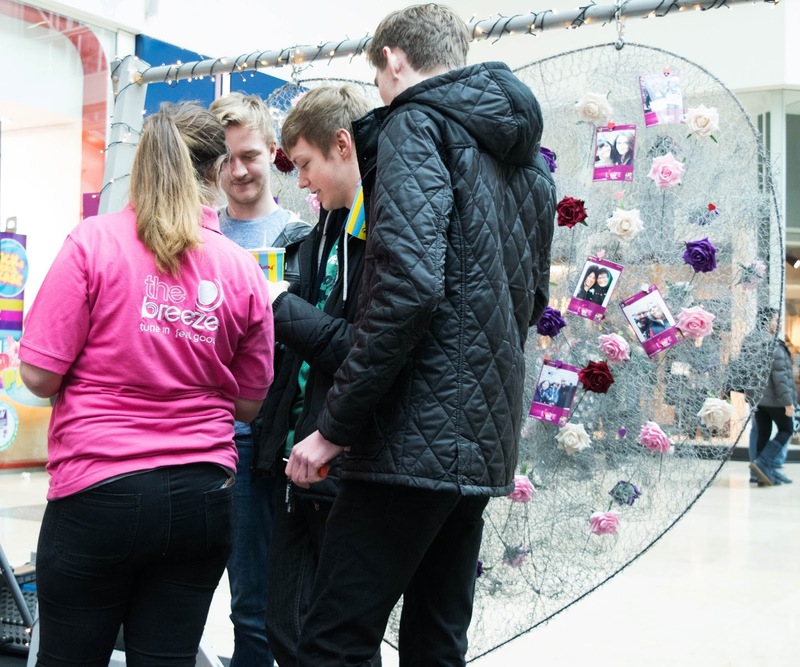 I went along with my Mum on Saturday to see what it’s all about! 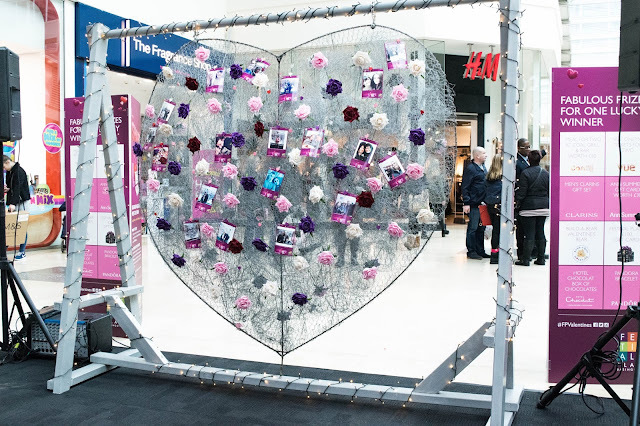 The first thing you come across in the space outside Marks and Spencer and Costa, is a giant silver heart, decorated with roses and fairy lights. 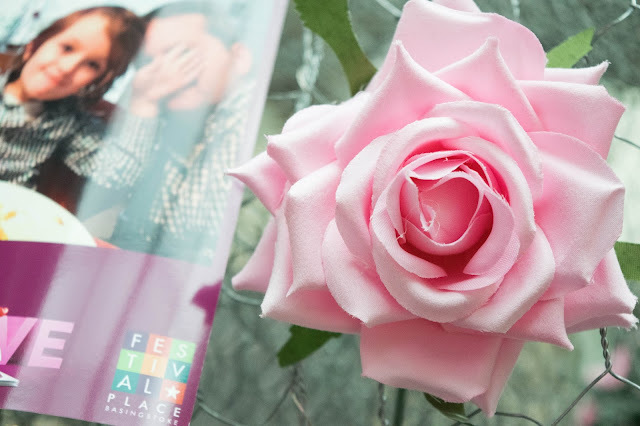 For anyone that was around Festival Place last year, this is the same heart that was used for the ‘Lock Your Love’ campaign, which raised an amazing £1,402 for The Ark Cancer Charity, but I think the pastel roses make it look even cuter! 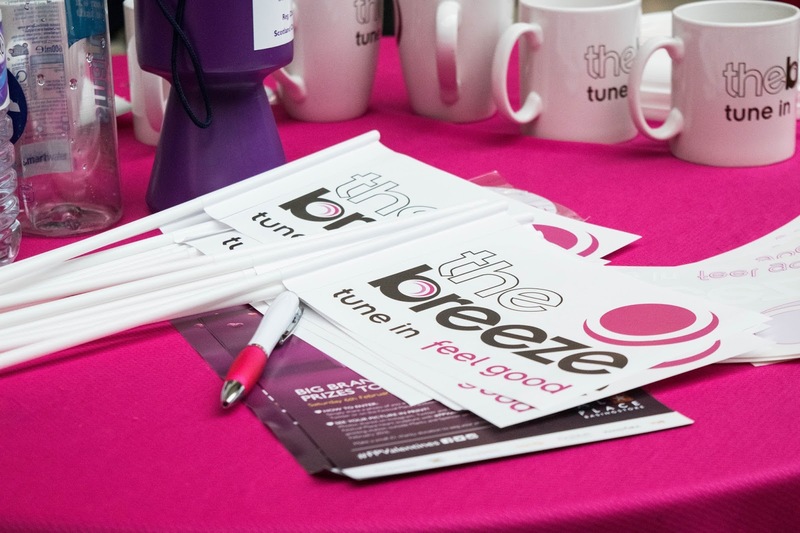 The Breeze Radio were also there, injecting some music and chatter into the mix. A deep purple sign directs you to a ‘selfie spot,’ where you are encouraged to donate £1 to charity and take a selfie in front of the heart, with a friend or loved one. You then upload your photo to Facebook, Twitter or Instagram, including #FPValentines for a chance to win a whole host of amazing prizes. Including the hashtag enables them to print out a Polaroid picture, which you can then peg to the giant heart for everyone to see. 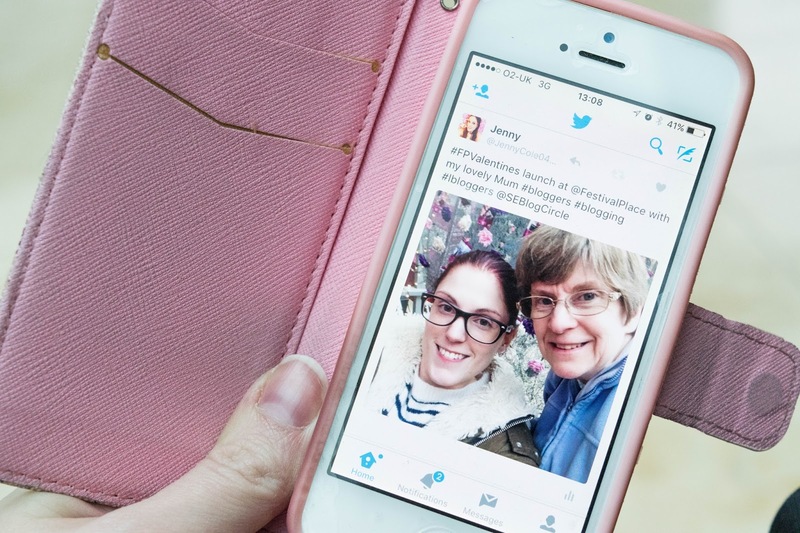 If you’re not on social media then don’t worry, you can still join in! 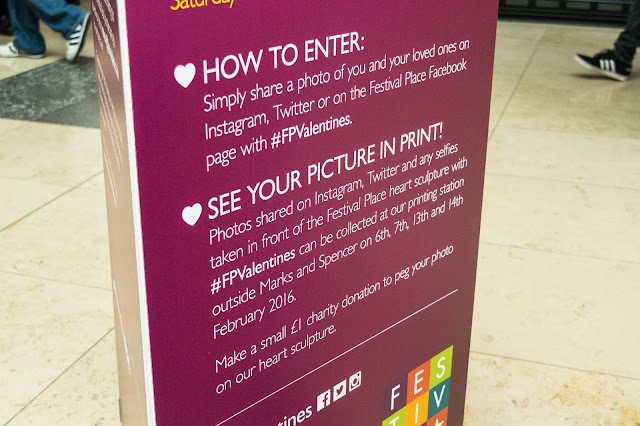 Simply email your photo to marketing@festivalplace.co.uk or bring one along on the day and pay your donation to the Festival Place Information Desk. Photos can be taken at any time, but they will only be available at the printing station outside Marks and Spencer on Saturday 13th and Sunday 14th February. 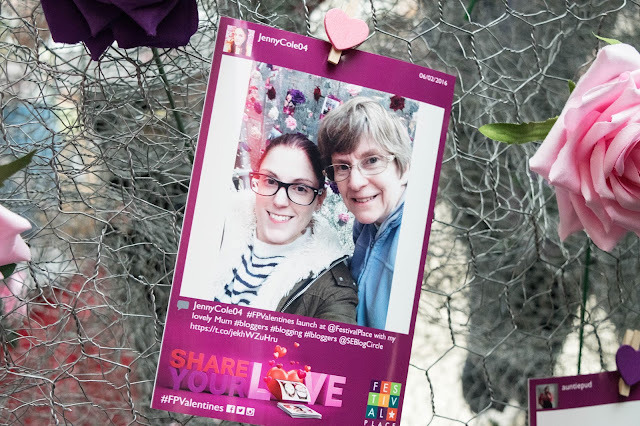 My Mum and I decided to have a go, so we positioned ourselves in front of the heart and snapped a few selfies. 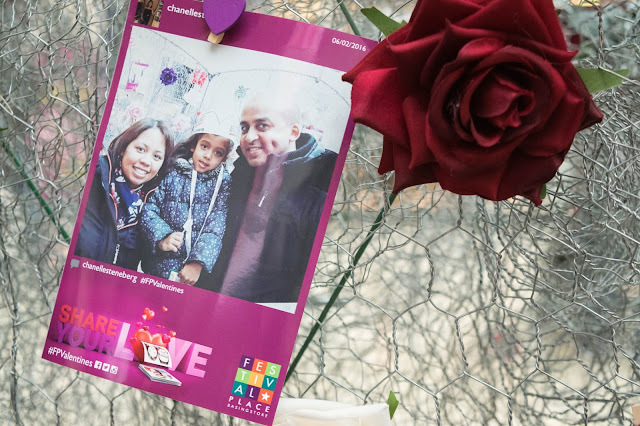 After choosing our favourite, I uploaded it to Twitter, including the #FPValentines, and as if by magic, we were presented with a copy of our photo to peg on the heart. 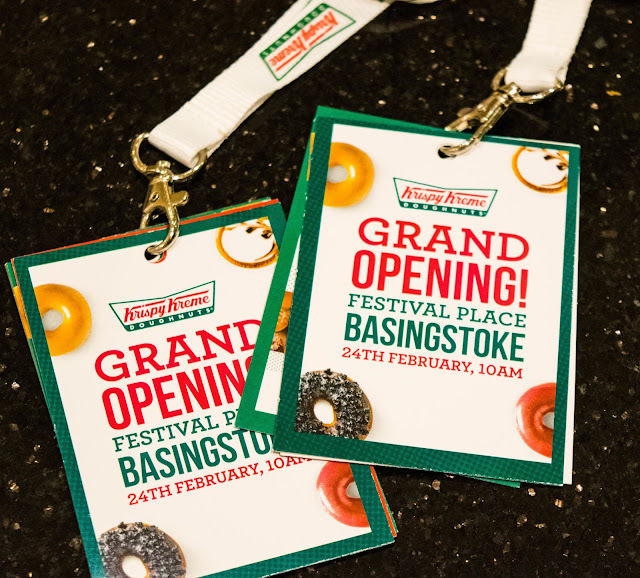 They also very kindly printed out another one for us to take home, so that is now pinned to the fridge! 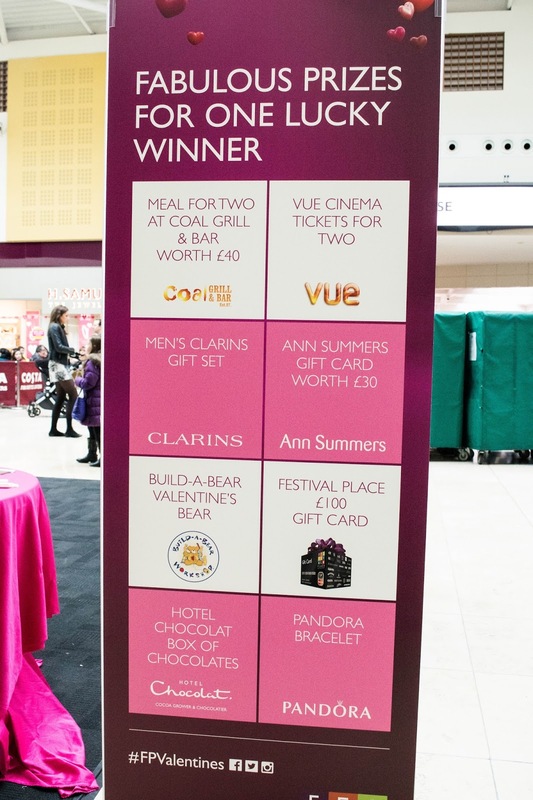 There are some fantastic prizes on offer, including Vue Cinema tickets for two, a Pandora bracelet and a Festival Place £100 Gift Card. 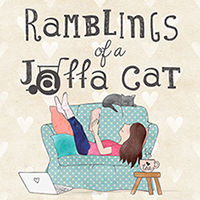 I’m keeping my fingers crossed for the gift card, although to be honest I’d be happy with any of the prizes! 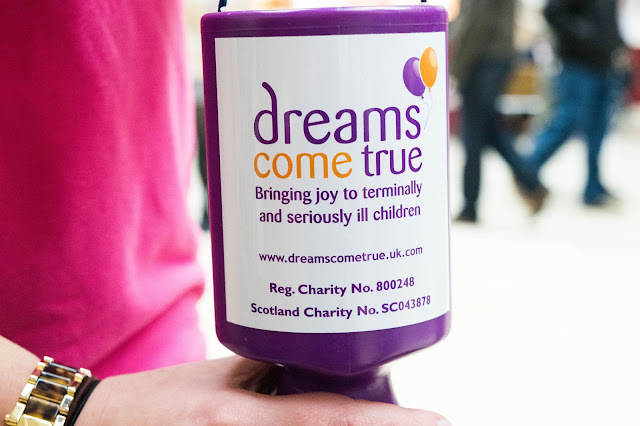 As well as the campaign being a bit of fun, Festival Place is also hoping to raise lots of money for local charity Dreams Come True. 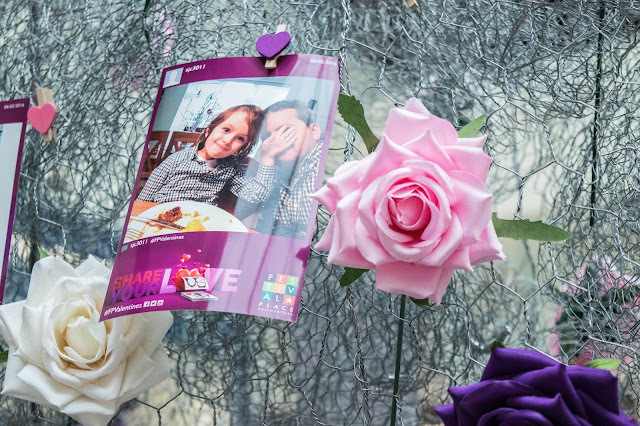 They are a national UK charity, based in Liphook that work hard to make dreams come true for children and young people with serious and life-limiting conditions. 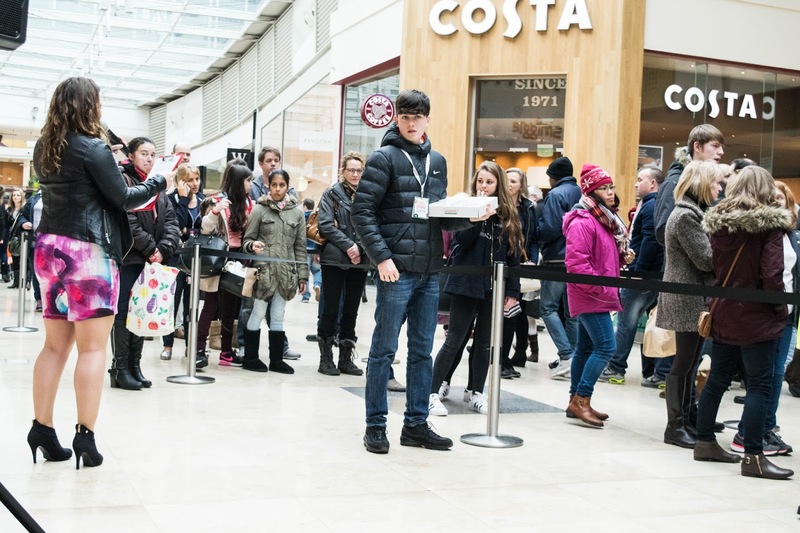 While I was taking some photos, Mum and I noticed a queue forming next to us. 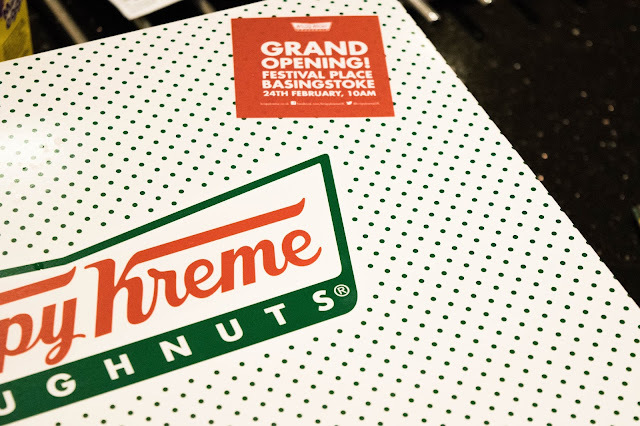 After some confusion, we realised they were handing out free Krispy Kreme doughnuts! My Mum quickly made her way to the back of the (ridiculously!) 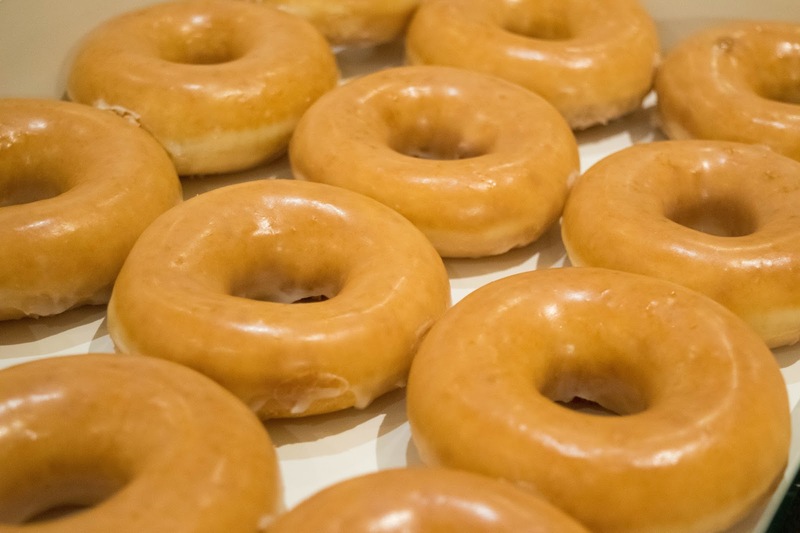 long queue, and some time later returned with two boxes of 24 glazed ring doughnuts! It turned out Krispy Kreme are opening a new store at Festival Place on 24th February at 10am, so were giving out 500 free boxes of their original doughnuts. We were definitely in the right place at the right time! 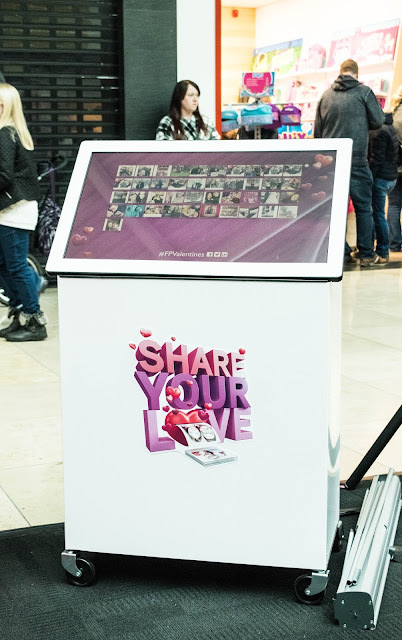 Will you be going along to Festival Place to ‘Share Your Love’ this week? 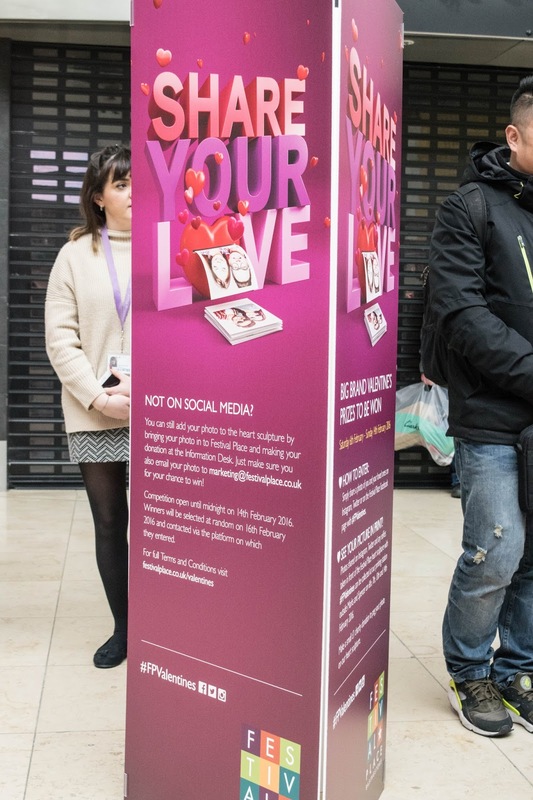 Do you have any plans for Valentine’s Day, or are you more of a scrooge like me?! 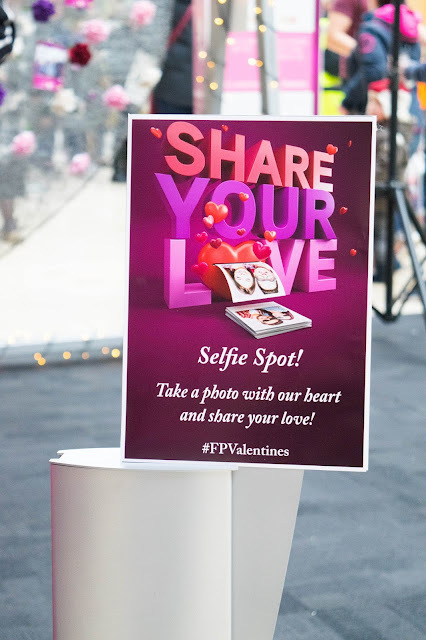 This sounds like a really cute idea and I love how the heart has been decorated! You were definitely in the right place at the right time, luck things. 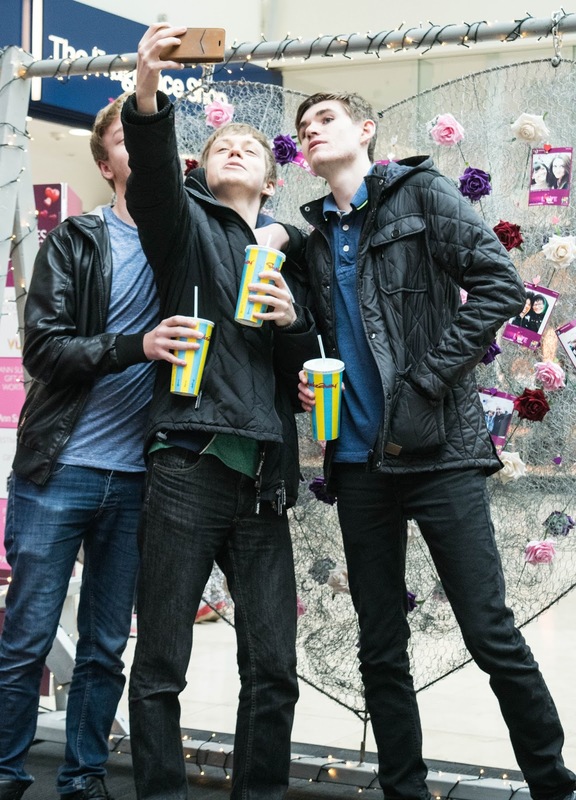 How long did it take you both to wolf down the doughnuts aha?